Why it’s daunting: Superman is arguably the world’s most recognizable superhero, but with 75 years’ worth of stories behind him, diving into the hero’s comic books can be intimidating. Like many characters that have been around since the Golden Age, there are a plethora of Superman interpretations, from the socialist crusader of his early years to the incredibly powerful alien outsider he is today. His powers make him the perfect figure for bombastic superhero action, but it can be challenging to find emotional stories that explore the humanity of the character. Throw in Silver Age silliness—including a menagerie of Super-pets and DC’s tendency to rewrite their characters’ histories every couple decades—and it becomes very difficult to find the right entry point into the world of the Man Of Steel. This summer’s Man Of Steel is aiming for a more grounded take on Superman, and the character doesn’t get more down-to-earth than he does in Kurt Busiek and Stuart Immonen’s spectacular miniseries. Secret Identity takes place in the real world where Superman is just another comics, TV, and film character, following a Kansas boy named Clark Kent from adolescence to late adulthood. Clark hates his name and the endless stream of Superman presents from family members and jokes from his classmates, but his opinion changes when he finds himself gifted with Superman’s powers during a solo camping trip. Busiek, whose Astro City is one of the most poignant and personal explorations of superheroes in comics, creates a narrative that captures the spirit of Superman without any of the baggage, providing a perfect introduction to the fundamental ideals the character represents. The story begins with Clark’s alienation as a teen before shifting into the internal conflict he feels as an adult keeping a secret identity from the woman he loves, resulting in one of the best Lois and Clark stories ever written. The setting allows for Busiek to explore the hero’s later days, showing how Superman would react to the responsibility of starting a family and the way he approaches retirement, telling a deeply emotional story about man who tries to hold on to a life of normalcy despite his extraordinary abilities and the duty that comes with that power. One of the great artistic chameleons of contemporary superhero comics, Stuart Immonen’s photorealistic rendering sells the idea that this story is happening in the real world. Clark’s experience is contrasted with images of the classic Superman, with Immonen referencing artists like Curt Swan and Bruce Timm to emphasize just how different Clark’s setting is from that of his comic-book counterpart. Those brief glimpses into former Superman eras help make Secret Identity a fantastic gateway, presenting a completely accessible story that pays tribute to what came before without being beholden to it. Next steps: Now that readers have a solid understanding of what Superman represents, it’s time to explore the actual comic-book interpretation of the character. Beginnings are always a good place to start, but when it comes to Superman origin stories, readers have plenty of options. Two drastically different but equally worthwhile origins have been published in the past decade: Superman: Birthright by Mark Waid and Leinil Yu and Superman: Secret Origin by Geoff Johns and Gary Frank. Birthright, inspired by the popularity of Smallville, takes a more modern look at Superman that is closer to what audiences will see in Man Of Steel, depicting a hip young Clark Kent who is just starting to get his bearings in Metropolis. Secret Origin is much more old-fashioned, reintroducing Silver Age elements like teen Clark’s adventures with the 31st Century’s Legion Of Superheroes and starring a Superman whose look is heavily inspired by Christopher Reeve. Reading both of these introduces readers to different interpretations of Superman, showing how the character’s story is malleable depending on the intentions of the creative team. After reading the hero’s beginnings, the best primers for comprehensive Superman knowledge come in stories about the Man Of Steel’s end. When DC ended its Silver Age continuity with Crisis On Infinite Earths, Alan Moore was tasked with writing the final story of that version of Superman in “Whatever Happened To The Man Of Tomorrow?”, teaming with legendary artist Curt Swan to give the most idealistic version of the hero a beautiful send-off. It’s a great way to become familiar with Superman’s rogues gallery and supporting cast, opening the door to years’ worth of Superman back issues. That should give readers enough information to fully appreciate Grant Morrison and Frank Quitely’s All-Star Superman, a 12-issue epic that approaches classic Superman concepts with a modern storytelling sensibility. Morrison shows a pitch-perfect understanding of what makes Superman so iconic, while Frank Quitely’s intensely detailed pencils bring new depth to a retro setting, balancing the non-stop spectacle of early superhero comics with a keen eye for subtle character moments. Where not to start: While there are some strong moments in Grant Morrison’s Action Comics run, the Superman titles of DC’s New 52 have been largely lackluster, although Scott Snyder and Jim Lee’s Superman Unchained will potentially change that. DC tried to create a cool (read: angsty and horny) version of the hero in the Superman: Earth One graphic novels, but the changes in Clark Kent’s character and origin diminish the impact of his story. 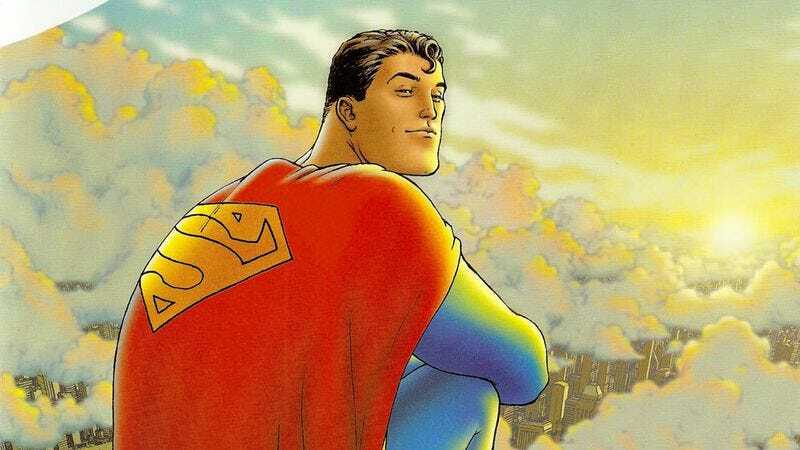 And despite being one of the bestselling comics of all time, “The Death Of Superman” tells a story about the “end” of Superman (he got better) without the introspection and reverence that make “Whatever Happened To The Man Of Tomorrow?” and All-Star Superman so memorable.